I noticed that this week of Jan 4th 2015 will bring another Arctic blast down on much of the country with even Atlanta, GA forecasting below zero temp. Meanwhile Western Washington has made the news with massive flooding on many rivers, With flooded down towns, mud slides, road washouts....all thanks to that Pineapple Express weather system from Hawaii. Our low temps this week will be in the mid 40's with highs in the 50's...quite warm even for our marine climate. Much of our snow pack has been washed away and many ski areas are closed. It was happening just as forecast....warmer winter due to moderate El Nino and the huge blob of warm water in the NE Pacific Ocean. 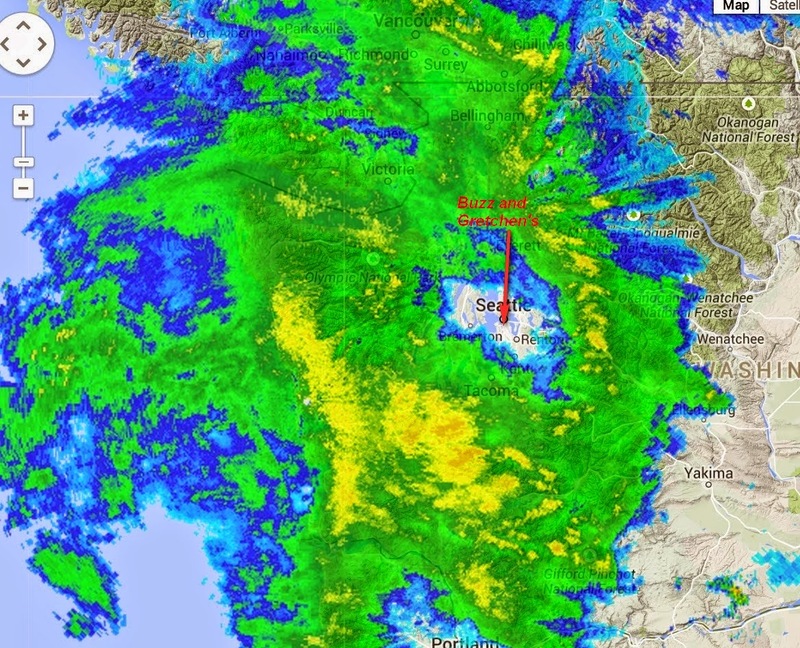 But while Western Washington was taking it in the shorts with extremely heavy rains Seattle was sitting in a tiny (city size) rain shadow provided by the Olympic Mountains. This happens whenever the rain and clouds come directly from the west rather than the more common pattern from the southwest. To get some idea of how strange this rain pattern can be in Western Washington you only have to look at a radar image.....Blue is rain, Green is heavier rain, Yellow is heavy rain....White is dry. This radar image is from January 4th but is the same on January 5th.